Red Yucca. Who would have thought that this remarkably adaptable plant would grow perfectly in such places as Phoenix, AZ AND Portland? We’re amazed and this excellent semi-succulent plant is one of our favorites for hot dry landscapes. The evergreen leaves form rosettes that spike up to about 2.5′ tall- blue green turning purple in colder weather. They are lined with little white hair filaments that add to the appeal. 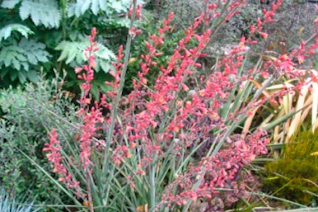 in summer flower spikes rise to 4′- many of them and hold tubular flowers that are succulent and red on the outside, when each yawns open it reveals a yellow center. Very cool. Full sun and average to poor well drained soil- though it does fine in any soil type that drains well. Excellently adapted to life in the blasting hot hellstrips. It can take any kind of reflected heat with no summer water and still perform beautifully. Clumps increase slowly in our climate. Excellent in containers as well. Loved by hummingbirds. Little to no supplemental water ever. Cold hardy below 0ºF. High deer resistance.